Photo by Karla Estrada | Beto O’Rourke, 2018 Democratic nominee for Texas’ 16th congressional district, speaks at Brookhaven College July 7 about issues such as immigration policy, healthcare reform and education. Hundreds of people crowded inside Brookhaven College’s gymnasium, Room T206, July 7 with T-shirts and holding posters that read “Beto For Senate.” Beto O’Rourke is a U.S. Representative for Texas and 2018 Democratic nominee for the U.S. in the Texas senate race. He spoke at Brookhaven for his Farmers Branch town hall stop as part of his campaign to obtain Texas’ 16th congressional district seat. In March 2017, O’Rourke began a state tour to visit all 254 counties in Texas as he promised, and with no PAC money in effort to engage better with communities across the state. Although he completed his journey June 9, he said he plans to continue holding town halls and intimate meetings with locals during the months leading up to the election, according to El Paso Times. Attendees crammed together in bleachers, crowding each side of the gymnasium, which maxed out its capacity. 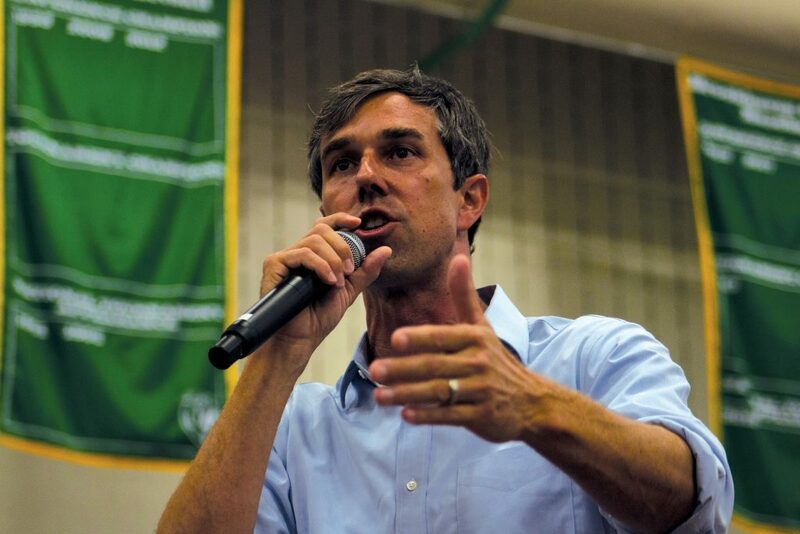 O’Rourke spoke on issues that have sparked controversy since Donald Trump became U.S. president, such as his zero-tolerance immigration policy, healthcare reform and stance on education. The Trump administration introduced the zero-tolerance policy to allow prosecutions of all undocumented individuals entering the country. The policy calls for the separation of parents from their children after they cross the border together. O’Rourke said the parents of children separated at the border did what they thought was right to seek asylum. He said he would do the same if he and his children were in danger. “This state, the most diverse state in the country, in the most diverse country on the planet – in other words the destination of choice for people – should be the one willing to lead the way on immigration, rewriting those laws in our own image to reflect our strength, our humanity and our ability to make the most out of everyone who chooses to come here,” O’Rourke said. Texas is known to be one of the least insured states in the U.S., O’Rourke said. One of his major goals is to provide proper healthcare for everyone. As a congressman, O’Rourke helped write the Honor Our Commitment Act of 2017 to expand healthcare and allow veterans to seek providers for their mental and behavioral health. This entry was posted in Campus News, Local News by The Courier. Bookmark the permalink.